With an increasing demand for software development services and a shortage of locally available tech talent, finding the right developer for hire has never been harder. If the solution you choose is hiring a developer remotely, it is vitally important to find a reliable outsourcing partner, but even more important to choose the right developer for your project. Since entering the market it 1999, we have performed thousands of developer interviews. We would like to share some of the knowledge we have acquired to help you connect with the most suitable candidates and make sure you don’t miss a great software developer. Here is our comprehensive guide on how to hire the best developers. Assessing the Сandidates. What Qualities to Look for When Hiring Software Developers? If you hire software developers with Daxx, you can take an active part in the candidate evaluation process. We select a shortlist of potential candidates with the suitable experience and submit their profiles for you to review, but it is entirely up to you how to interview the software developer and on which criteria to assess the candidate. When selecting a software developer for hire, technical skills and domain expertise are obviously the number one priority. Yet there are more qualities to pay attention to. This is the developer’s ability to voice their opinions, explain their ideas to a non-technical client in simple words, and be easy to communicate with. These are important skills and should be taken into consideration. If the software engineer is able to collaborate effectively, can be a team player, has a positive attitude and the ability to adapt — this is a massive plus for the candidate. If the developer is not a native English speaker, soft skills may depend on the programmer’s proficiency in English. Please keep in mind that the better a person’s knowledge of English is, the easier it is for them to communicate and feel comfortable during a conversation. Sometimes it can be difficult to understand whether your non-native English speaking candidate has good soft skills. In these cases, don’t rely solely on the first impression, talk to the candidate more. Ask for a second interview if needed. A developer who seems reserved and distant in their interview might really open up as you get to know each other. After all, you don’t want to miss out on a developer with great technical experience. Moreover, required levels of English can differ from project to project. In some cases, an intermediate level of English is enough, while others require more advanced linguistic skills. According to recent research, over 60% of Ukrainian developers have an intermediate or upper-intermediate level of English. Moreover, senior developers are much more likely to speak advanced-level English. Software development is a highly dynamic environment. This is why it is important that your team members are up to date with the latest advancements and are willing to expand their skillsets. There are many ways that candidates can show their willingness to constantly upgrade their professional level: take online courses, contribute to open source GitHub projects, create pet projects, contribute to a tech blog, participate in hackathons and meetups, speak at conferences, and even teach other people (lectures, mentoring, and more). If any of the above-listed achievements appear in your candidate’s resume, this should be considered as a benefit. If they do not, you can always ask the candidate directly about any of such experiences. One of the most often-voiced concerns is the lack of communication and collaboration between the members of a geographically dispersed team. Regular communication is needed to run an offshore development team efficiently. It is therefore essential that the remote developers you hire are proactive and can take initiative. If you get too caught up with your on-site operations and forget to hold regular online meetings, a developer can bring up this problem and suggest more frequent meetings and a format that will facilitate the process. In the Daxx model, each client has an assigned HR/client manager whose responsibility is to stay in touch with clients and developers, and to collect feedback that will allow them to identify potential problems in communication or in the work process at the early stages. If a candidate shows an understanding of your business model and is genuinely trying to get to the core of the problem that product or service is trying to solve, it is definitely a good sign. In this regard, Ukrainian developers are known for their commitment. They will usually accept an urgent call or address a critical issue during non-working hours. Moreover, when you hire a software developer with Daxx, you get a full-time employee, who is dedicated to your project only, just like any other member of your in-house team. That is why our offshore development teams have higher commitment levels than freelance developers or teams in outsourced projects. You can also influence the level of a developer’s commitment by integrating them into your team’s everyday operations. If you want to make them feel like a part of your team and for them to have an affinity to the product, invite them to online meetings with other team members, or try to bring them to work on-site, at least temporarily. When hiring software programmers online, most interviews are held via Skype or other video conferencing tools. If needed, our clients can schedule several interviews with the candidate and interview as many developers as they like. 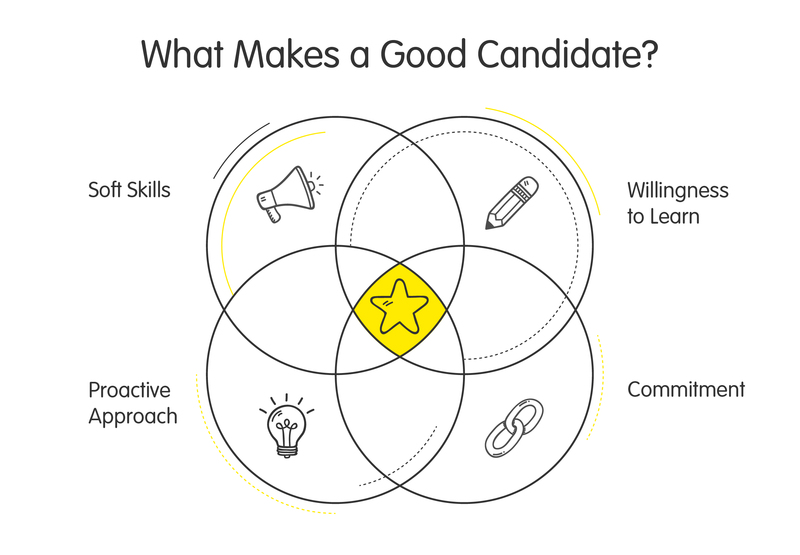 To understand whether a candidate is the right developer for your team, you can set up a technical screening with a team leader and a personal interview with the founder. Think about your interview’s structure in advance, such as what questions you would like to ask and in which order. At the interview stage, some of our clients run a virtual pair programming session to evaluate the candidates, while others ask the candidate questions that help them see how the candidate thinks and approaches problems. Skype has recently introduced an Interviews feature, which can make interviewing software developers much easier. Instead of using Google Docs for coding sessions, you can now use the in-built realtime code editor to see your candidate in action. Make every interview a dialogue. This will be less stressful for your candidate and will bring more practical value for both of you. The best format for an interview is experience exchange. If you don’t agree with the solution a candidate suggests, ask about their reasoning and suggest an alternative solution (if you have already encountered such problems earlier). Encourage candidates to ask questions. This is an opportunity for the candidate to learn more about your business and corporate culture, and for you to build a personal connection with the developer. Avoid questions that are not likely to give you insight into developer’s actual skills and knowledge. For example, Google has stopped using its logical test during interviews, because there was no proven evidence that good logical test results had a direct correlation with the future performance of the candidate. Don’t forget to sell your company. Explain your company’s mission and values, what makes your product or service different from your competitors, and what makes your company unique. In case you still have any doubts about a candidate, test assignments can be a great way to see if a person is well suited for the job. Remember, first appearances can be deceptive, so focus on technical skills above all else. Not sharing enough information about the project. If you are afraid to share details with a candidate because of the potential information leaks, have them sign an NDA. Without a proper understanding of the job, it is difficult to feel excited about it. Asking developers to complete a large test task. While it is a great way to assess a candidate’s skills, nothing demotivates candidates more than a large assignment that takes 4–6 hours to complete. Having too many interview stages. While we understand that your established interview process may include a number of general and technical interview rounds, you need to know that the demand for Ukrainian software developers is extremely high. Chances are, the candidate you’re interviewing is considering a few other job offers at any given moment. 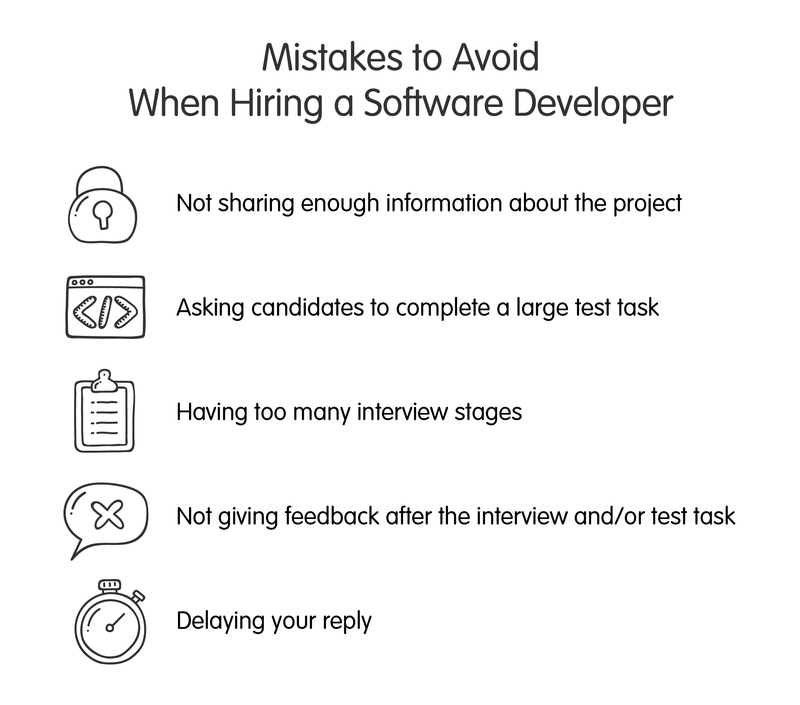 Our advice is, when you see a good developer, don’t hesitate to offer them the position, even if normally you’d invite them to a few other interviews. Not giving feedback after the test task and/or interview. Even if the interview was not successful, make sure to inform all candidates about your decision and to give suggestions about what to improve. Delaying your reply. While this can be hard, you need to be able to make decisions fast. Skilled developers are always in high demand. If you keep delaying your reply, another company can poach your candidate first. As soon as you have made your decision, you should set the wheels in motion by properly onboarding your developers. The first days at a new job are very important for your software developers, especially if they are going to work remotely. A proper onboarding process will help you lay the groundwork for future productive work. First of all, make sure to choose the right approach and toolset. In this regard, Agile project management (namely, Scrum) is one of the most popular approaches to conduct the software development process in remote teams. It can be successfully used regardless of distances and time differences. The Agile process relies heavily on regular communication between the client and the development team. In this regard, we recommend using dedicated project management and cooperation tools. Trello, Atlassian JIRA, Redmine, Target Process, Team Foundation Server (TFS), or Visual Studio Team Services (VSTS). Skype, Slack, Google Hangouts, and Hipchat are among the most popular communication tools used by our remote teams. Irrespective of time differences, there are many ways to set up a transparent and efficient cooperation between your on-site employees and offshore development team. For example, Ukraine and the USA have between 7 and 10 hours time difference. Following the Agile/Scrum methodology, you would schedule all regular meetings with the team for the morning (US time). We also encourage our clients to come visit their remote teams in person. This helps them establish good connections with the developers and build stronger teams. On the other hand, it is always a good idea to invite your developers to work on-site, at least in the early stages (onboarding) to immerse them into the project and kickstart the development process. Ukrainian developers can now travel visa-free to the EU countries and the Schengen zone. We also cooperate directly with the American Chamber of Commerce for visas and paperwork on the developer side, so the entire American visa preparation process only takes about two weeks on average. 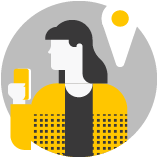 In case there is no opportunity to travel to your team or to invite them over to your location, you can set up a general meeting to put your new hires into the picture. Established communication channels between your on-site team and your developers are crucial for long-term cooperation, and you need to maintain this connection throughout your project. If you hire software engineers with Daxx, we will help you by streamlining communication with your team. We avoid many possible issues by assigning a dedicated client/HR manager to your project. This person will keep you up to speed with your project by constantly communicating with you and your development team and gathering feedback that will help you prevent new problems or solve existing ones. Moreover, Daxx handles your developer’s onboarding and retention on-site by taking care of their work environment and by conducting regular team building events. Why Hire Software Developers with Daxx? No upfront charges. All initial research and recruitment costs are on us. You pay only when the selected candidate starts working for you. Streamlined hiring and retention. We take care of all the processes related to hiring, onboarding, and retaining your developers in the our offices in Ukraine. This allows you to focus on what is most important for you. Access to one of the largest talent pools in the world, with over 50,000 software engineers for hire. Ukrainian software developers are in high demand worldwide, thanks largely to their strong technical skills and high quality of work. Complete control over your development team. You can manage your developers directly, as if they were local employees. Software developers that work on your project full time. Our staff are directly accountable for their results, and committed to building great products. Geographical proximity. Most of the European countries are just a few hours away, with direct flights available. This means you can visit your team on-site. As mentioned, Ukrainian developers can now travel visa-free to the EU and Schengen countries, allowing you to invite your team to your business location for proper onboarding and training. Your IP rights are safe with us. Every developer you hire will sign an NDA. Flexible engagement model. With Daxx, you can scale your team up and down, whenever needed (with only one month’s prior notice). Our hiring model is straightforward: you tell us what you need and we do the rest. As soon as you submit the request, we set up a call to discuss the project in detail and to finalize your requirements. Once we have a complete understanding of your needs and expectations, we choose the candidates that meet your requirements and provide their CVs for your consideration. After that, you can personally interview each candidate and select the ones that perfectly meet your requirements. With a database of over 50,000 developers and tech specialists, we conduct pre-screening and select the most suitable candidates. You can personally review each developer’s resume and choose the most suitable candidates for an interview. Depending on your requirements, you can ask for developer portfolios, code samples, test tasks, live coding sessions, and reference checks. While we select the candidates and provide all the necessary information, the decision making process is completely up to you. You simply interview and select the best candidates personally. It usually takes 3-4 weeks to pre-screen, interview, and hire software developers. So in just one month, you will get a dedicated software development team up and running in your own remote R&D center. All of our clients are entitled to professional support and guidance. Your team will receive all-round support from our service delivery specialists, system administrators, travel agents, office managers, and accountants. This means that you can work solely on your project and that your developers can perform at their best. Ready to Hire Software Developers with Daxx? Getting started with Daxx is easy. You can review the CVs of developers for hire who are ready to take on a new project instantly. If you can’t find a candidate who meets your requirements, or if you are looking for a specific skillset or expertise, submit a contact request using our contact form. Our sales manager will get in touch with you and help you finalize your requirements.